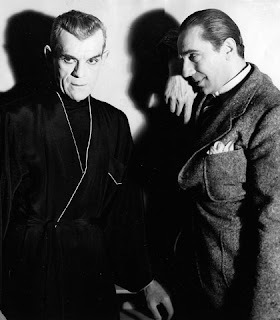 Fifteen years after he was made a prisoner-of-war by his general's betrayal, Dr. Vitus Werdegast (Bela Lugosi) has tracked down the old friend who betrayed him; crazed architect and Satanic priest Hjalmar Poelzig (Boris Karloff). Poelzig's menacing Hungarian abode, built on the mass grave of 10,000 soldiers who died in WW1 because of his treachery, is the place where the two wage a dark, psychological battle, with the lives and souls of a stranded honey-mooning American couple Joan and Peter Allison (Jacqueline Wells and David Manners) as the wager. 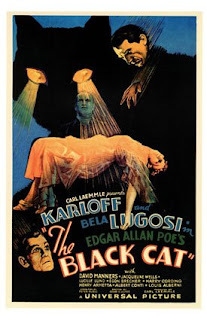 The Black Cat is a significant genre entry for many reasons, the most obvious being that it was the first film that featured both Boris Karloff and Bela Lugosi together. Despite the title however, The Black Cat does not resemble the titular tale by Edgar Allan Poe. Indeed the only relevance the title bears to the film itself is that Lugosi’s character suffers from Ailurophobia (fear of cats). While a handy plot device, this notion is not really explored further. 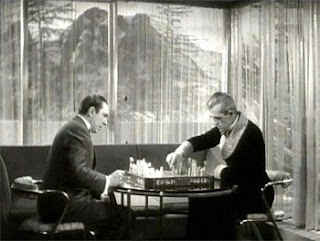 Karloff and Lugosi were apparently bitter rivals and unquestionably successful in their own rights. The Black Cat is also the only film were each was given equal billing and screen time. The few other films they collaborated on were essentially Karloff’s films and the ailing Lugosi had to make do with glorified cameos. 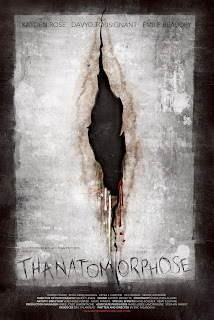 In this film, both are given equilibrium to shine darkly. And both seize the opportunity. 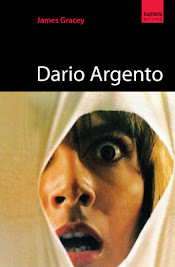 The film is saturated in a smothering air of foreboding and dread. The mansion in which events unspool is a veritable nightmare of art-deco design, startling lighting design and palpable doom. Made up of overtly geometric shapes and straight lines, it contrasts perfectly with the warped and twisted psyches of those who inhabit its uncanny walls. It also offers a refreshing take on the usually dank and putridly crumbling castles much of Universal’s horrors were set within. Karloff’s Poelzig is an architect not only responsible for designing his morbid home, but also his own downfall, brought about by his overwhelming greed and obsessive nature. The fact that his house is built on the very spot where he caused the deaths of so many is a constant reminder of his sordid past; one from which he can never escape. death is essentially a main character in this film too. It is eventually revealed that Poelzig married Werdegast’s wife, and then his daughter, while the doctor was locked away. Poelzig has also been preserving the corpses of prior brides, upright, in some dreamily bizarre class cases – their ethereal beauty contained for all time. The scene in which Karloff reveals these eerie beauties provides the film with some of its most arresting and haunting images. 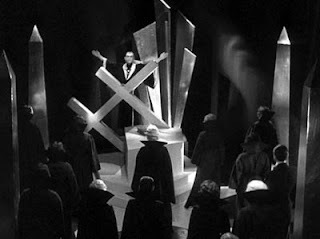 The Satanic ritual featured at the climax is one of the most moody and striking ever committed to film – the altar resembles something from The Cabinet of Dr Caligari in all its impressionistic glory. What follows in the scene where Werdegast finally seizes the opportunity to avenge himself on Poelzig, is subtly powerful and immensely disturbing. 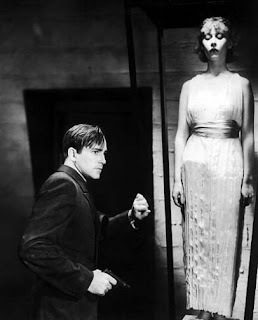 Ulmer takes the Lewton approach to conveying how Poelzig is flayed alive by showing us nothing more than writhing shadows on the dungeon wall. 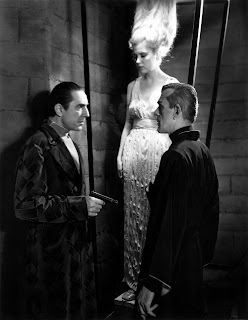 Karloff and Lugosi are both exceedingly admirable as the two men whose lives are locked in a twisted embrace of obsession, betrayal and death. Each is as thoroughly demented and menacing as the other and the battle of eyebrow acting that ensues is a pleasure to watch. 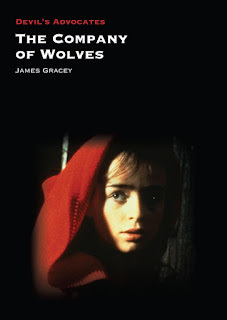 The scene in which they challenge each other to a game of chess, the wager being the lives of the honey-mooners, is a great showcase of their sombrely sinister performances and perfectly illustrates the manipulative nature of their characters. Lugosi delivers one of his best performances: world weary and restrained, yet driven on by his sordid obsession with revenge. Unfortunately the honey-mooning couple are as bland and conventional as many of Universal’s other horror protagonists at the time. Wells spends most of her screen time screaming, fainting or clutching tightly to her guy. Manners doesn’t fair much better as the typical macho all-American guy who says things like 'I don't know. It all sounds like a lot of supernatural baloney to me.' Luckily Lugosi is at hand to retort 'Supernatural, perhaps. Baloney, perhaps not. There are many things under the sun.' Go Bela. The hugely symphonic swell of romantic music that plays every time our couple embrace, (which happens a lot), feels a touch intrusive and overwrought. The Black Cat is one of Universal’s most underrated and under-appreciated genre films. Equal parts dark allegory and blatant symbolism, the impressionistic canvas it drenches is breathtaking in its beauty and stifling in its oppressive, doom laden atmosphere. Melancholic, macabre and menacing.